Editor’s note: The leaders of the 10 ASEAN countries, including Cambodian Prime Minister Hun Sen, are about to travel to an unprecedented US-hosted meeting with US President Barack Obama at the Sunnylands estate, California, set for Feb 15-16. The meeting comes as the US looks to step up its foreign policy initiative known as the pivot, or the rebalance to Asia, an attempt to counter growing Chinese influence in the region. The government of Cambodia, which has close trade and diplomatic ties with China, has said it does not want to pick sides in a contest between superpowers. With the US-Cambodia relationship in the spotlight, VOA Khmer’s Neou Vannarin sat down for a comprehensive discussion on Wednesday with William A. Heidt, the American ambassador in Phnom Penh. Heidt was sworn in as ambassador on Sept. 14, 2015, and previously served as economic and commercial officer at the US embassy in Cambodia from 1997 to 1999. What are the priority sectors for your mission in Cambodia? 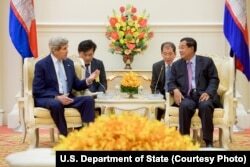 I think Secretary [of State John] Kerry touched on some of the things we’re most excited about working with Cambodia. He mentioned, of course, our work together on POW/MIAs [prisoners of war and soldiers missing in action] over the years; our work on building our people-to-people relationship; and he also talked about our hope to build our economic relationship. 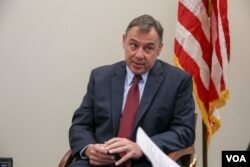 My specialty in the foreign service for 28 years has really been economic trade and development. I feel very lucky to be here in Cambodia at a time when really there are a lot of interesting possibilities to work together more closely on those issues. So I’m excited about making progress on those trade and economic issues. I also note that the people-to-people relationship between the United States and Cambodia is very strong. Of course, VOA helps a lot in that respect. But there’s a lot of interest in studying in America and learning about America. And our cultural exchanges—especially some of the artifacts we have been able to return to Cambodia—that’s also an area where I think there’s a lot of exciting things we’re going to be able to do in the next three years. 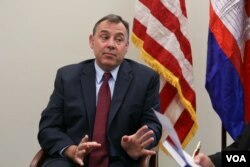 ​How do you think the trade relationship between Cambodia and the US can be improved? The United States is Cambodia’s largest single-country trading partner and largest single-country export market. We already have a big and strong trade relationship. But the trading world is changing now. The United States just signed the Trans-Pacific Partnership trade agreement with 11 other countries. In fact, we just signed it last week in New Zealand. The text of that agreement is now made public. That’s going to change regional trade. That’s going to drive economic integration in the region. That agreement is designed with an open architecture. Right now, we’re focused on getting it through our own Congress—and all the other parties to the agreement are getting it through their parliaments—but, eventually, that’s going to be out there as a possibility for Cambodia. We want to start looking at the issues with Cambodia, working on concrete steps we can take that will both increase our trade now, but [also] set Cambodia up, potentially, for some day coming into the TPP. [That’s] one of the things we talked to [the Cambodian government] about—we had a very good discussion last week when one of our delegation from the US Trade Representative’s office was in town. We had a very good discussion on the possibility of doing a bilateral investment treaty [BIT]. That’s a treaty that gives American investors in Cambodia additional legal protections, and the same thing for Cambodian investors in America. We think that would help Cambodia attract higher-technology investment that would enable Cambodia to manufacture and export sophisticated [products] in what they called global value chains. That’s the way trade works these days. It’s not so much products are made from one country and exported directly to another. But now inputs come from many countries and they get assembled in one country. They may get shipped to a second country for final packaging and consolidation, and then maybe get shipped to another country yet. So there are these networks called global value chains, and Cambodia is just starting to get into them. So what we want to do is—with things like a bilateral investment treaty—help Cambodia to get into those global production networks. I’ll say that both sides are looking at the BIT—we haven’t made any decisions. The Cambodians are trying to see if it’s in their interest, and the United States is also looking at that issue as well—whether it’s in our interest. But I think it’s potentially a very exciting step. 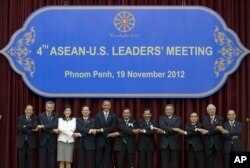 ​How important are ASEAN and Cambodia to the US? Well, of course the fact that we’re having the summit—the first time any US President has ever invited all the leaders of ASEAN to come to America—is a sign that it is an important region for us. Of course, the Secretary was just here in Cambodia and Laos. He said when he was here it was his seventh trip to the region. And that also shows how important it is. If you add it up, there are simple reasons why. [ASEAN] is the world’s seventh largest economy. I believe it’s our fourth largest trading partner, if you add all the ASEAN countries together. The economies are growing rapidly in many countries, including Cambodia. So it’s very natural for us, as we implement the policy we call the rebalance to Asia—that is, giving Asia the appropriate amount of diplomatic and economic attention it deserves. As we rebalance to Asia, it’s very natural that ASEAN is a big part of that, and Cambodia is right in the middle of ASEAN. So we want Cambodia to be part of that process. That’s another one of the reasons that the Secretary was here. We think there’s a lot we can do to improve our relationship. Cambodia can benefit from integration inside of ASEAN with the United States. So we’re very excited about that. Do you think Cambodia will get something from the summit, like improved trade ties with the US? After the summit itself, which is in Sunnylands, we’re going to have what we call the trade roadshow. There’s going to be series of meetings in the San Francisco Bay Area. After the summit, they are going to have meetings to talk in detail about economic issues, also to meet big US companies, potential investors in the region, so that all the countries can have some good meetings with our important economic people out there. That will be a part of the process. One of the sessions in the summit is going to deal with innovation, entrepreneurship and economic growth. So we’re going to have a good discussion on those issues at the summit as well. I don’t think it’s going to be a concrete announcement. There’s not going to be new trade agreement announced or anything like that, but that’s certainly one of the three main topics that are going to be discussed. China has been growing in influence in Cambodia in recent years. How does that impact Cambodia’s relationship with the US? Everyone wants to talk about that now. Look, we’re sophisticated people. We understand Cambodia wants to have a good relationship with many countries. We don’t ask Cambodia to choose between China and the United States or anyone else. We understand, and we wouldn’t like it if a country asked us to choose either. We understand that it is in Cambodia’s interests to keep a good, strong relationship with China and to keep a good, strong relationship with the United States. I can see, having been here in the 1990s, China has given Cambodia a lot of assistance on infrastructure. It’s much easier to get around this country. There are new roads, there’s electric infrastructure China has helped Cambodia to build. That’s all good. We understand why Cambodia would be interested in that. But I think, as an economist, in the next step for Cambodia’s development, America is going to be very important to it. Those trade ties I described, the integration—helping Cambodia move up the value chain in manufacturing. Some observers have expressed concern that the US is not putting enough pressure on the Cambodian government on human rights, democracy and governance. How can your mission help on these issues? To me, at the end of the day, it’s not that different than the economic side. We hope for step-by-step improvement, just like in the Cambodian economy. As the Cambodian economy develops, we hope that the democracy develops too. The Secretary said we want to deepen our relationship with Cambodia, but we also think that Cambodian people want a democratic, multi-party system. That’s going to be important. That’s going to affect the way our relationship develops. To me, Cambodia needs to just keep making progress on democracy and human rights issues. I think some of the civil society groups in Cambodia are really very good for the country. They’ve brought Cambodia a lot of credit internationally. Supporting civil society groups is something we have done for 20 years, and we are going to continue to do. Cambodia has had five elections now. Naturally, we hope that each election gets a little bit better than the one before. We think that’s what Cambodian people want too…. I think they want a full multi-party competitive democracy, and we hope Cambodia will keep moving towards that. FILE - U.S. Secretary of State John Kerry, left, addresses Cambodian Prime Minister Hun Sen at the outset of a bilateral meeting at the Peace Palace in Phnom Penh, Cambodia, Jan. 26, 2016. The political situation is currently quite tense, with opposition leader Sam Rainsy outside of the country avoiding charges in the courts. Do you have any suggestions about how to ease the political tension in Cambodia? I haven’t actually seen Mr. Rainsy since I’ve been back. He has only been here for a couple of days since I came to Cambodia as ambassador. But it struck me that the ‘culture of dialogue,’ if you look at the original provisions, was a very sensible thing. It’s not, honestly, the way we do our politics in America. But I thought, for Cambodia, it was a very sensible way to sort of turn down the political rhetoric, to try to have open…respectful disagreements. To fight over policy issues, but not over personalities. Like I say, we don’t have things like the culture of dialogue in America, but to me I understand why Cambodia did, and it made a great deal of sense to me. That was last May when the culture of dialogue came, and it seemed to break down pretty significantly in October/November. But things are a little better now. I notice the opposition party is able to work more in the provinces than it was. It’s doing its things, like a political party should. But, to me, the question is: Can we get back?… The first step is a more respectful political discourse, where we’re not throwing insults at each other, but we’re disagreeing over policy. I would note, incidentally, that on the Trade Union Law, they are doing just that. The two parties are working pretty well together and having very subjective discussions on how to reform the Trade Union Law. So I think that’s the first step. That will help reduce tensions—to go back to the principles of the culture of dialogue. It’s not a natural situation to have the opposition leader in the situation where he can’t return to Cambodia—or he feels he can’t return to Cambodia. We’ve made that clear in our statements last Fall. I think you’d like to see a process that results in him being able to come back and resume his normal political life, and normal political situation. Sam Rainsy has asked for President Obama’s help to mediate political discussions. Do you think that can happen? You’re talking about the letter he wrote. I saw the copy of that letter. Obviously, we made sure that got delivered to the President [Obama]’s office. I don’t really know or have a comment for you on how they’ll react to that. I do think they take it very seriously, but I am not sure if that’s something we have to do during the Sunnylands conference or not. I also think that there’s been some progress recently in Cambodia and that the parties are talking themselves. While we wait, while we look at that letter, I think they should continue that talking and, really, there’s much they can do without mediation as well. Will the US provide any more funds for the Khmer Rouge tribunal? The importance of bringing the Khmer Rouge leaders most responsible for that era to trial, we’ve always supported that. Over the years we’ve given…over $30 million, which makes us really one of the very largest contributors, so our record in contributing the tribunal is clear. We do our funding year by year. The Congress passes budgets every year. We’re working with the Congress right now on what the size of our contributions going into the future is going to be. But of course, as the overall cost of the tribunal comes down, our contributions have gone down as well. Why does the US continue to support the tribunal? That was the darkest era in Cambodia’s history. Those four years, they continue to affect the country today, in big ways and small ways. We’ll never know some of the personal trauma. How do you repair that? All the trauma that millions of Cambodians went through during that period. My wife was one of those—she was here in Cambodia during the Khmer Rouge era, so she knows that personally. The tribunal, of course, isn’t perfect. We agreed early on that we were going to seek to bring to trial those most responsible for the crimes of that era. You could argue, what good is it, to try [only the top leaders]? Why focus on a few older people? But to me, it’s important to do that, it’s symbolically important, it’s important for the development of Cambodia’s legal system. It’s important to show Cambodians from that era, even if they can’t get a full measure of justice—as we say in America—there is some justice out there. We support it because it is the right thing to do and we think it’s important for Cambodia. 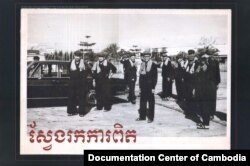 We also support, incidentally, other things, and prominent among those is the Documentation Center of Cambodia, which is really doing a lot to simply document what happened in that era, which most people don’t know. Many younger Cambodians don’t really have a full idea of what it was like to live in Srok Khmer back then, and so the Documentation Center has put together a lot of good information that is going to be available for the future generations so that Cambodians can understand your own history. It’s a young country and, rightfully so, it’s looking forward. I think Cambodians are very future-oriented. Honestly, the parts of the relationship that I am most excited about are those forward-looking elements. We are trying to do a lot of science and technology, helping Cambodia on coding and all those 21st century economic skills they’re going to need. Young people in Cambodia, that’s what they are interested in, I understand that. But I don’t think one should forget the past either.